150 REAL GRE Quantitative Reasoning questions--direct from the test maker! 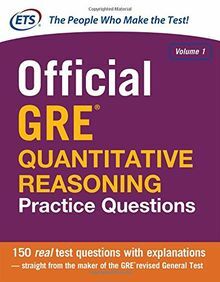 The best way to prepare for the Quantitative Reasoning measure of the GRE revised General Test is with real GRE test questions--and that is what you will find in this unique guide! Specially created for you by ETS, it offers 150 actual Quantitative Reasoning questions with complete explanations. Plus, this guide includes a review of math topics likely to appear on the Quantitative Reasoning measure. Only ETS can show you exactly what to expect on the test. So for in-depth practice and accurate test preparation for the Quantitative Reasoning measure, this guide is your best choice! Real GRE Quantitative Reasoning test questions arranged by content and question type--to help you build your test-taking skills. Plus, mixed practice sets. Answers and explanations for every question! GRE Math Review covering math topics you need to know for the test. ETS's own test-taking strategies: Valuable hints and tips to help you do your best on the test. Official information on the GRE Quantitative Reasoning measure: The facts about the test content, structure, scoring, and more--straight from ETS.